Farmhouse style has taken the design world by storm. From farmhouse bedrooms, to bathrooms to everything in between, the country is embracing the rustic, minimal feel of modern farmhouse style. Designed for those who live a casual lifestyle, need super function and love a look that's happy, carefree and all around lovely. It's the style that seems to define the words, "the kitchen is the heart of the home." The good news is that farmhouse kitchens can be designed in a wide variety of styles; Farmhouse-modern, Farmhouse-French, Farmhouse-Shaker? Yes, and so many more - take a look! A true, authentic, farmhouse kitchen is one that is made up of a collection of disparate pieces, perhaps a DIY functional element here and there, and charming color. Perfect imperfection! Uber warmly-colored durable countertop material made of French lava just begs to be used for baking, projects and cooking up a storm. A farmhouse kitchen may well have an antique furniture piece in the kitchen with an abundance of heirloom, useful or other well loved items displayed for all to enjoy. Nothing says classic quite as much as a white kitchen. A white farmhouse style kitchen is open to possibilities - an oversized antique pot holder tells a story of kitchens long ago. Sunny yellow walls cast a happy glow in this welcome farmhouse kitchen. A pantry with open shelves filled with useful and decorative items is always the right choice to design into a farmhouse kitchen. Displayed against an unexpected black color, the look is elevated with a touch of chic! An open ceiling with beams adds a warm, hand crafted look to a farmhouse style kitchen. 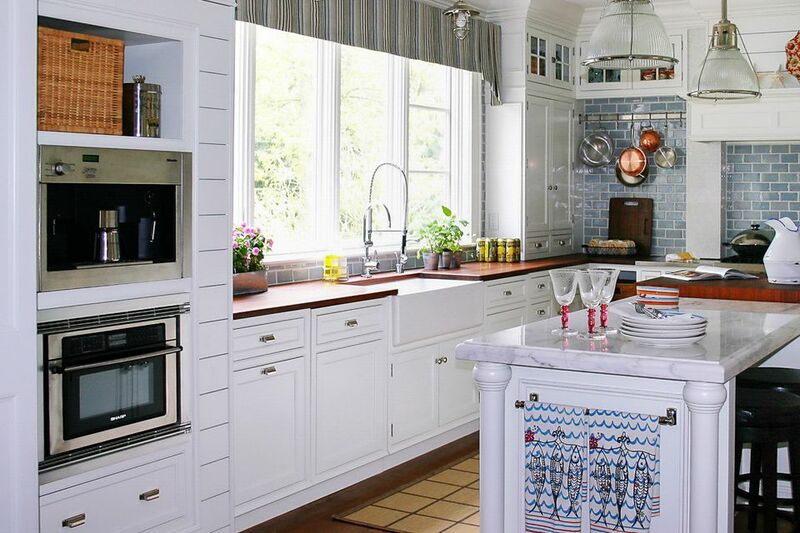 Checkerboard tiles, an apron sink and lots of white trim is classic farmhouse style. Farmhouse style responds to the home's architecture and quirky architecture is all the better! Skirted fabric is a surprisingly functional element in a farmhouse kitchen. Just a quick move of the skirt along a metal rod exposes a wide section of shelving behind. A wall of handmade subway shaped tile in a grid pattern adds a modern touch - Scandinavian inspired! Quilts displayed in a prominent place, surrounded by the warmth of wood furnishings surely define farmhouse style! Quilts add such beauty, texture and color but also a sense of history - a soulful dimension in the most soulful room in the house, the kitchen. Happily homespun! Such fun to find and so functional, using crockery for storing utensils is a perfect accessory for the farmhouse look. Group whisks in one piece, wooden spoons in another and utensils are instantly organized. Utensil crocks are easy to place anywhere in the kitchen. A French farmhouse look has more curves in cabinet doors, more dressed up details and surfaces that have lots of texture. Color always plays an important part in French country kitchens and blues are the color of choice. Pattern is always a good idea in a farmhouse kitchen. Plaid, floral - any abundant use of pattern is exactly what everyone loves about a country kitchen! Keep it to just 2 or 3 colors and/or neutrals and the look will flow and appear cohesive. Farmhouse style kitchens often have timeless design elements. Traditional, timeless design feels comfortable. Its classic good looks are always in style, sometimes nudging a farmhouse kitchen design toward a sophisticated but relaxed aesthetic. Best of both worlds. Custom designed pantries are all about function! Behind the doors, an abundance of storage aids is possible. Pegboard, shelves, door racks, roll out shelves, electrical outlets, shelf lifts, slide out counters - the uber functional possibilities are endless. Industrial farmhouse style is a new interpretation of two well loved looks and they are perfect together! Highly textured surfaces, DIY finds or high end surfaces, it all works AND the beauty of this look is that it's an easy high/low collection of materials - splurge here and salvage there. All good! Open shelves are ideal for farmhouse style kitchens. Open shelves with color are even better. You can get this look easily by painting the insides of open cabinets - just the back or the entire interior, the fronts of shelves or group shelf items by color to make a design statement. Reclaimed wood is ideal for farmhouse kitchens! Find it, salvage it and put it anywhere. This countertop extension is highly functional and is a strong and interesting design element. Perfect for a modern, rustic or retro farmhouse look. Neutrals in farmhouse kitchens are a natural - group together textures, neutral shades in similar tones and colors or use neutrals ranging from lights to darks. Kitchen equipment, serveware and dinnerware in neutral shades will make this farmhouse kitchen style look like a thoughtfully designed composition. Industrial elements are a natural addition for a modern farmhouse look. Once again, open shelving is made for farmhouse kitchens. Items that are easily accessible is the best and most functional way to cook. Decorative bins are a great storage aid and items grouped together become both useful and beautiful. Stack up those cans and bottles for a sculptural, graphic focal point. Farmhouse style can easily devolve into a jumbled look. Resist the temptation to use too many colors in large areas. This farmhouse kitchen style uses one color, green, and is much more visually organized. This way, you can sneak in many functional pieces and the focus will be on the larger blocks of color! Rails are perfect for the farmhouse kitchen. Rails can go anywhere - across and above the cooktop, along the backsplash, on any available wall. The good news is that a collection of useful items, decorative items, salvaged items, textiles and antique pieces can create a changing composition. Perfect for farmhouse style! The modern farmhouse look can include color, whimsical new or refreshed retro patterns. Large, sliding doors can be used for pantries, upper or lower cabinets to create a kitchen with great visual impact - a farmhouse kitchen "wow"! Modern farmhouse style may have clean lined design elements such as cabinetry but with lots of texture. It's a super warm look to be surrounded by similar but different wood textures and colors. Add in oversized hardware, an industrial design element and it's thoroughly modern. An old farmhouse home with great bones may include a spacious built-in pantry, complete with beautiful woodwork. Make it a focal point with a historical paint color and outfit shelves with a mix of useful and decorative items. Such a homey look when behind glass doors! An oversized sink is ideal for a farmhouse style kitchen. This soapstone sink, custom designed, can handle anything! The backsplash to the sink keeps the faucet off the countertop, providing the largest sink possible. An authentic material and strong contrast to surrounding cabinetry creates a beautiful focal point in this kitchen! With a traditional shaker foundation, richly colored wood countertops, a prominent spot for tea towels, baskets for storage and hanging pots, it's a classic kitchen with a nod to a farmhouse vibe.